Take on the UK’s newest white water course and raise money for Parkinson’s. 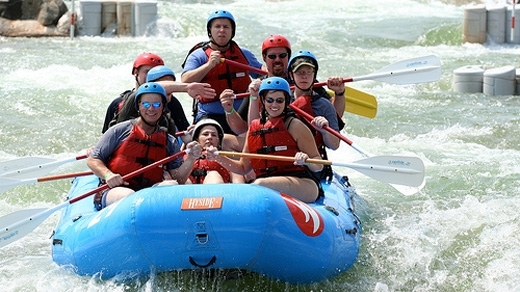 Highly trained instructors will show you the basics to tackle the rapids in a six-man white water raft. Help raise money for the Michael J Fox Foundation by joining Parkinson’s supporters in sponsored dance classes and an art auction. The Adidas Women’s 5km starts in Republic Square and winds down to the river. Then, when the sun sets, the Birell 10km race begins. Open to all runners with the unique experience of running through Prague at night, while raising money for Parkinson’s causes. Join fundraisers throughout Canada as they walk to raise money. Parkinson SuperWalk is the largest nationwide fundraising event for the organisation Parkinson Canada and each year more than 10,000 people from coast-to-coast take part. The annual ECNP Congress is Europe’s premier scientific meeting for disease-oriented brain research, with neuroscientists, psychiatrists, neurologists and psychologists from around the world in attendance. The registration deadline is 31 August 2016. As Australia’s largest annual community event, A Walk in the Park is a chance to celebrate, support and empower people living with Parkinson’s. Every dollar raised helps support people living with Parkinson’s in Australia. Join more than 3,500 people from 65 countries at the WPC 2016 to learn about cutting-edge science, clinical research and comprehensive care, from some of the most renowned health professionals, researchers, and advocates. The third ‘Rallying to the Challenge’ conference will focus on the importance and use of data in the Parkinson’s research arena. The EHFG is the leading annual health policy event in the EU. This year’s conference focuses on demographics and diversity in Europe and new solutions for health. For their third annual forum, titled ‘Next Society’, academics and health professionals will present their recent research projects. Dr Helene V Hjalmarson will discuss ‘Physical activity on Prescription for a Healthy Future’.